If you have a child then you know keeping them on the path of learning when playing games is not always easy. Many children of all ages just want to play war games or Facebook using your expensive iPad or computer. So what is a parent to do? The answer is with LeapFrog and their all new leappad which is a great tablet for kids, stuffed with fun and educational games and apps for children. No this is not a iPad or tablet built for going on the internet. This was designed for children that are younger and they need activities that will keep them happy, busy and learning all at the same time. One of the best parts about this “toy” is that it helps your child excel at their pace. Also you can check on your child’s progress by plugging in the LeapPad to your computer and connecting it with LeapFrog Connect. This will tell you how much time your child has spent on each game (or multiple children if you have more than one), what areas they have mastered and what they are still working on, and even gives recommendations for what games they suggest to help build additional skills. The LeapFrog Connect is intended to be a central place for all of your LeapFrog toys. You can watch each child’s learning journey across all of them. 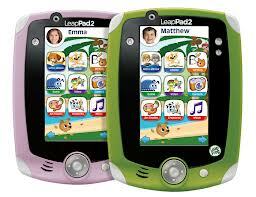 The LeapPad has an intuitive interface that has a bright color touch screen. Also it has a rugged chassis, 2GB of onboard memory and a built-in camera and video recorder. The controls are easy to use and there are more than 100 applets available for download. The LeapPad is intended for kids up to age 8, so be sure to check the age range on games before purchasing. The LeapFrog LeapPad Explorer offers the coolness of a tablet with some solid learning tools for kids. I recommend the leappad to any parent.